Anti-coal activists marched on Saturday before the beginning of San Francisco's Global Climate Action Summit. Anti-coal activists protested outside a "responsible investment" panel discussion in San Francisco today because one of the participants, the Bank of Montreal, has been involved in talks to finance a controversial coal export terminal that an Oakland developer and a Kentucky-based mining company hope to build in West Oakland. The protest was the second by the Oakland activists this week while San Francisco hosts a Global Climate Action Summit. 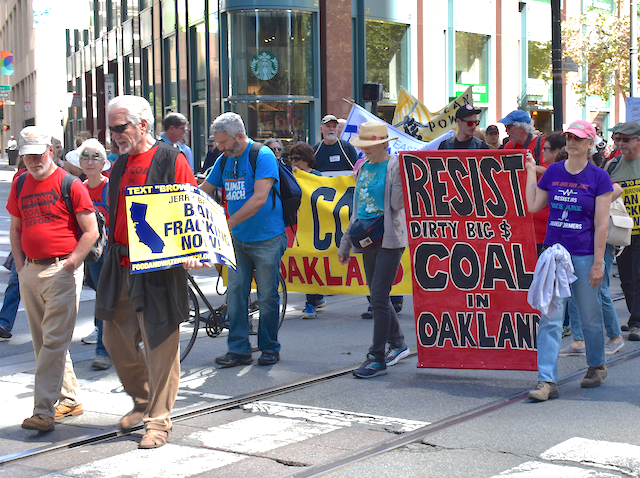 Ted Franklin, a coordinator of No Coal in Oakland, said the group was rallying outside the Marriott Marquis hotel, where the panel discussion was being held, to demonstrate opposition to the project and highlight what they consider to be an irresponsible investment. “There can be no terminal if there’s no money,” said Margaret Rossoff, an organizer with No Coal in Oakland. Plans to build the coal terminal first became public in 2015. Coal company Bowie Resource Partners, which owns mines in Utah, has been working with Oakland developers Phil Tagami and Mark McClure of the California Capital Investment Group to find a way to ship Utah coal through Oakland to overseas markets. The Bank of Montreal has been involved in the discussions as a source of financing for the project. In 2016, the Oakland City Council passed an ordinance banning the storage and handling of coal in the city, citing health impacts. The ban would have effectively killed the coal export terminal, but the city was sued by the Oakland Bulk and Oversized Terminal, the company owned by Tagami and his business partners. OBOT won the lawsuit after a federal judge ruled the city violated its 2013 development agreement allowing the company to build a bulk commodity export terminal. Oakland is currently appealing the decision and briefs in the case are due at the end of October, according to Erica Maharg, an attorney with San Francisco Baykeeper who is working on the case. The city’s legal team is being supported by the Sierra Club and the Baykeeper, which intervened in the case. In West Oakland, a working-class neighborhood of color, residents worry about how coal dust will increase air pollution in an already severely polluted area, one bisected by emission-heavy freeways. Rossoff said the impact of shipping coal through the Bay Area can already been seen in Richmond. Currently, the Port of Richmond exports coal from Utah transported in by train. Rossoff said the cars send up fine particles of coal dust that coat Parchester Village in northwest Richmond. Richmond has exported coal for many years, but “the amount has increased recently,” Rossoff said. This means more coal passing through the East Bay. In addition to public health concerns, opponents of the coal terminal worry investing in coal transportation infrastructure will slow the decline of coal, the dirtiest fossil fuel. They see the terminal as an extraction industry gambit to become a necessary part of Oakland’s economy and tax base. But to stop climate change, the world economy needs to reduce its use of coal. The coal terminal’s proponents include a group comprised almost solely of its investors, include four coal-producing counties in Utah, Utah’s biggest coal extractor Bowie Resource Partners, and the aforementioned Bank of Montreal, in addition to the Oakland development team led by Phil Tagami. Representatives for the Bank of Montreal didn’t respond to a request for comment.